It’s hard to comprehend given how we just went through the release of The Last Jedi, but in just over four short months, a new Star Wars movie will be out. While Last Jedi honored Star Wars’ legacy by passing the torch to a new generation, with new possibilities, Solo will rosily indulge in Star Wars’ past. And I think I might have had enough of that. Now, don’t get me wrong, I fully expect Solo to be decent, maybe even great (and that’s despite the major creative overhaul the movie went through in its bumpy replacement of original directors Phil Lord and Chris Miller). It is, after all, a modern Star Wars movie, and so far they’ve had a pretty solid track record. So this isn’t a knock on whatever the film’s purported final quality is going to be. But my sudden apprehension for Solo’s nostalgia-driven smuggler’s run is because The Last Jedi shockingly tore down the need for the established order of Star Wars itself. It showed us an exciting new generation, armed with the knowledge brought by the successes and failures of the generations before it, which could break the cycle and forge its own path. Although it’s proved somewhat divisive among fans, I fell into the camp that completely loved the message The Last Jedi had about the galaxy far far away, both positive and critical. It galvanized a lot of the lingering doubts and thoughts I’ve had about what I want to see out of Star Wars, especially now that it’s ever-present in our pop cultural landscape again, thanks to Disney’s relentless release schedule. Mainly, it gave me the realization that I’ve had enough of the Republic/Empire battle, and that it’s time for Star Wars to try something brave, and new, without that structural framework. To me, The Last Jedi was, as both Admiral Holdo and Poe Dameron intoned in the movie, the spark that would light a fire—a fire that could guide the way into a truly new era for Star Wars. But up next—and coming alarmingly soon—we have Solo, which represents the exact opposite of that. It’s a character we’ve known and loved for over 40 years. It’s an exploration of the things we already knew about him. Oh, to learn how Han Solo became a daring smuggler! To learn how he became friends with Chewbacca, with Lando Calrissian! To see the iconic Kessel Run! To learn how the Millennium Falcon fell into his hands and apparently lost a white-and-blue paint job in the process! 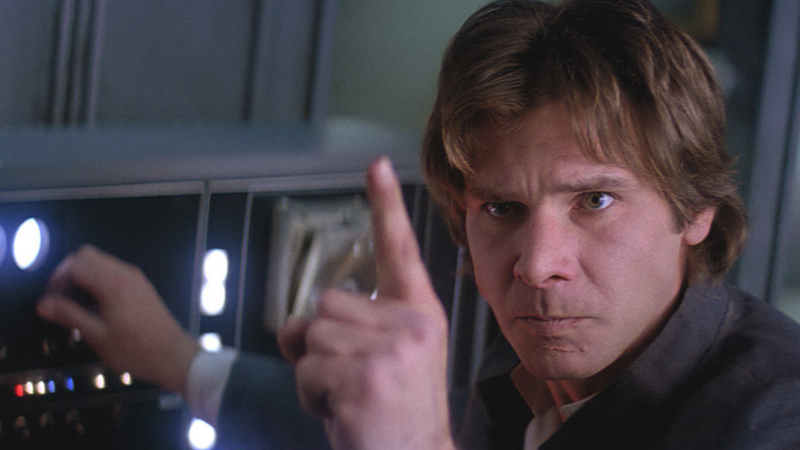 Here’s Han Solo, doing Han Solo-y things, and isn’t that great? It’s an indulgent filling-in-of-gaps that, while never seen (at least in this Wild West of the still-fresh Disney canon) before, were already filled in enough that we got the general picture. Yet it wouldn’t feel so much like navel-gazing if it were the only movie latched on the Star Wars status quo. Rogue One is a prologue that literally leads directly into the events of A New Hope; it’s basically just an addendum to the original trilogy. Even The Force Awakens, while executed wonderfully, essentially served as a lavish aping of the original trilogy, proving the same beloved formula could be bottled once again after the prequels (which, regardless of how you feel they turned out, at the very least were also trying to do new things). The Star Wars Story spinoffs would have been—and would still be—the perfect opportunity to explore new parts of the franchise, but so far they haven’t. But it took The Last Jedi to push Star Wars in directions I’d wanted to see for a while—new fights, new characters, new struggles, and most importantly, new spins on the age-old conflict between the dark and the light where clearly anyone can be the hero. Like I said, this doesn’t mean that Solo will necessarily be a bad film. And there should definitely be space in Star Wars’ future for nostalgic exploration—especially as The Last Jedi has also made it clear that a good chunk of Star Wars fandom absolutely wants more stories about its most familiar characters and concepts. But after The Last Jedi proved that Disney and Lucasfilm are more than fine with pushing the needle on Star Wars, and that this is just taking the first step into a larger world, to immediately take a step back into the past can’t help but feel like a bit of a disappointment to me.